A 2.7-litre turbo engine will be available for the 2019 Silverado line. The 2019 Chevrolet Silverado 1500 will be offered with an all-new, technologically advanced 2.7L Turbo that expands the range of available engines and builds upon additional choices to help customers find a Silverado that perfectly suits their needs. Standard on LT and RST trims, the new engine delivers an SAE-certified 310 horsepower and 348 lb.-ft. of torque, for 22 percent more torque than the 4.3L V-6 it replaces. Developed specifically for truck applications, the new 2.7L Turbo inline four-cylinder engine delivers peak torque from 1,500 to 4,000 rpm. The next-gen Silverado with the 2.7L Turbo delivers 0-60 mph performance in less than seven seconds and weighs 380 pounds less than the current Silverado with the 4.3L V-6. Compared with competitive full-size trucks, the Silverado 2.7L Turbo is expected to deliver comparable towing and payload capability with greater torque and fuel efficiency than the 3.3L V-6 in the Ford F-150 XLT and the 3.6L V-6 in the Ram 1500 Big Horn. "The new 2.7L Turbo is a technological marvel, with our most advanced valvetrain," said Tom Sutter, chief engineer for the 2.7L Turbo. "With a broad, flat torque curve and quick throttle response, it punches above its weight, delivering surprising performance and efficiency." The cornerstone of the 2.7L Turbo is an innovative double-overhead-cam valvetrain that enables Chevrolet's first use of Active Fuel Management (cylinder deactivation) on a turbocharged engine, high- and low-lift valve profiles, and continuously variable valve timing. Dual-volute turbocharger housing, for improved throttle response and low-speed torque. Chevrolet's first application of Active Thermal Management, which uses targeted engine heating and cooling to improve engine performance in hot and cold ambient temperatures. An integrated exhaust manifold that is part of the cylinder head assembly and recovers exhaust heat for faster engine and transmission warmup, with quicker turbo response. An electric water pump that eliminates the drag of a conventional, engine-driven pump to enhance efficiency. It also enables continual cabin heating even when the engine is shut off by the stop/start feature. 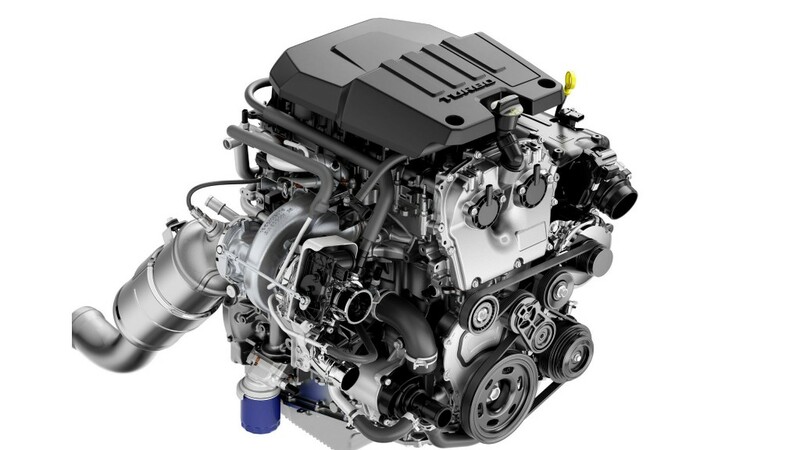 The new 2.7L Turbo engine represents a clean-sheet design for Chevrolet and was developed from the outset as a truck engine. To help generate the strong, low-end torque customers expect in a truck, it was designed with a long piston stroke of 102 millimetres (4.01 inches), which is the distance the piston travels up and down within the cylinder. The long stroke enables improved combustion and thus a higher compression ratio. Typically, a long stroke can increase the load of the pistons against the cylinder walls, generating more friction. That's alleviated in the 2.7L Turbo with an offset crankshaft. It is slightly off-center from the cylinders, allowing a more upright position for the connecting rods during their movement. To support the high cylinder pressures that come with turbocharging, the crankshaft is made of forged steel, and the pistons are made of a tough aluminum alloy with a cast iron ring groove insert. All elements of the 2.7L Turbo were designed for the demands of turbocharged performance in a truck environment; the engine was subjected to the same rigorous durability standards as the Silverado's proven V-8 engines. The 2.7L Turbo features an aluminum block and cylinder head for reduced mass. The 2.7L Turbo's valvetrain is GM's first to incorporate variable lift, duration and Active Fuel Management to optimize performance and efficiency across the rpm band. It is a key reason the engine's peak torque is available at only 1,500 rpm. "It's like having different engines for low-, and high-rpm performance," said Sutter. "The camshaft profile and valve timing is completely different at low and high speeds, for excellent performance across the board." The camshaft design alters the lift of the intake and exhaust valves. As the engine load changes, electromagnetic actuators allow a movable shaft containing different cam lobes to shift imperceptibly between high-lift and low-lift profiles. Lift is the distance the valve travels from its seat when opened, and duration is the amount of time the valve remains open. Higher lift and longer duration allow more air to flow into the combustion chamber, so the system's high-lift lobe profile enhances performance at higher rpm, while the low-lift profile optimizes efficiency at low- and mid-range speeds. The 2.7L Turbo engine employs an advanced dual-volute turbocharger that elevates the performance and efficiency advantages of a conventional turbo, with quicker response and enhanced low-rpm torque production. Rather than a single spiral chamber (volute) feeding exhaust gas from the exhaust manifold to drive the turbine on the turbocharger, the dual volute design has a pair of separate chambers with two exhaust gas inlets and two nozzles to drive the turbine. The design allows the exhaust pulses of the engine to be leveraged for faster spool-up and subsequent boost production, particularly at low rpm, where the effect significantly enhances torque output and driveability. It works in unison with the engine's integrated exhaust manifold/turbocharger housing, which splits the exhaust channels from the cylinder head so the exhaust flows through two separate channels in the turbo housing, based on the engine's exhaust pulses. When complemented by the precision of the engine's valvetrain, that separation leverages exhaust scavenging techniques to optimize gas flow, which decreases exhaust gas temperatures, improves turbine efficiency and reduces turbo. An electronically controlled wastegate and charge-air cooling system support the turbocharger and enhance its effectiveness. Compared to a conventional wastegate, the electronically controlled version offers more precise management of the engine's boost pressure for smoother, more consistent performance. With the charge-air cooler, the pressurized, heated air generated by the turbocharger is pumped through a heat exchanger before it enters the engine. That lowers the air charge temperature by about 74 degrees Celsius (130 F), packing the combustion chambers with cooler, denser air that enhances power production. The system achieves more than 80 percent cooling efficiency with less than 2 psi (12 kPa) flow restriction at peak power, contributing to the engine's available torque production at low rpm. A variable-pressure oiling system, with a continuously variable-displacement vane oil pump, enhances efficiency by optimizing oil pressure as a function of engine speed and load. With it, the oil supply is matched to the engine requirements rather than the excessive supply of a conventional, fixed-displacement oil pump. Active Thermal Management helps the engine warm up faster and achieve its optimal engine temperature for performance and efficiency. The system uses a rotary valve system to distribute coolant through the engine in a targeted manner. It sends heat where it's needed to warm up the engine to reduce friction and heat the cab, or cools when needed for high power operation. An electric water pump - a first for Chevy trucks -supports the Active Thermal Management system and further enhances the engine's performance and efficiency by eliminating the parasitic drag that comes with a conventional engine-driven water pump. Direct fuel injection is used to optimize efficiency and performance. With direct injection, a higher compression ratio (10.0:1) is possible because of a cooling effect as the injected fuel vaporizes in the combustion chamber, reducing the charge temperature and improving resistance to spark knock. Direct injection also enables scavenging from the combustion chamber to the turbo for fast response. Dual overhead camshafts contribute to the 2.7L Turbo's smoothness and high output, with dual independent continuously variable valve timing working with the valvetrain to deliver optimal performance and efficiency. The dual independent system, which allows the intake and exhaust valves to be phased at different rates, promotes linear delivery of torque, with near-peak levels over a broad rpm range, and high specific output (horsepower per litre of displacement) without sacrificing overall engine response or driveability. An integrated exhaust manifold on the cylinder head assembly promotes faster engine warmup and quicker turbo response. Oil jets located in the block are employed for performance and temperature control. They target the underside of the pistons and the surrounding cylinder walls with an extra layer of cooling, friction-reducing oil. The jets reduce piston temperature, allowing the engine to produce more power and enhance long-term durability. Stop/start enhances fuel economy in city driving. The driver-selectable system shuts off the engine at stoplights and certain other stop-and-go situations, saving fuel. The engine automatically restarts when the driver takes their foot off the brake. The all-new 2.7L Turbo is matched with a Hydra-Matic eight-speed automatic transmission, featuring enhancements designed to improve shift quality, as well as a new centrifugal pendulum absorber torque converter that reduces vibrations to improve smoothness. The 2019 Silverado goes on sale this fall. Transport Canada fuel economy estimates and towing/payload capacities are not available yet and will be announced closer to launch.